The blue star is hotter than any other star in the universe. They are bigger than most other stars and can be seen across the world. Wintingo has the same dynamics with a blue star advert that says it all. Let the blue star guide your course to one of the most unique online bingo sites to come around in a long time. Wintingo has taken all the wonderful elements of bingo and created a new constellation of games. The homepage is designed in blues that match the sky with a brilliant display of games. The sky is the limit to bingo variations that are riveting with a whole array of gaming that won’t compromise your playing preferences. Wintingo has an impressive payout on games with an average of 98% across the board. The eCogra seal represents a site that is committed to fair gaming and honest business practice.Microgaming software is a leader in providing excellence in game quality and services. Wintingo is licensed and regulated by Kahnawake Gaming Commission. They have gone bingo crazy with 7 variations of this long time favorite. 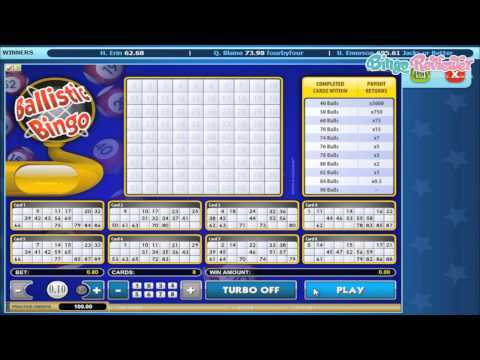 Instant Bingo is the answer to online bingo traditionally played games. Here you won’t find a chat moderator or multi-players, instead instant bingo games with no waiting and jackpots up to 200K. It’s a new concept in online bingo and players love it. Besides Instant Bingo other games include Ballistic Bingo, Bingo Bonanza, Spingo Bingo and Super Bonus Bingo and that’s just the beginning of games offered. Scratch Cards and Instant Win offer a large variety of games with themes that are adorable, appealing to all types of players. Slots are amazing with Progressive Jackpots that are life changing to a single lucky winner. Wintingo knows how to treat players and with the enormous free cash No Deposit offer you won’t find anything quite better. Take advantage of this super generous gift and play risk free. A lucrative Bonus is available on first time deposits. Scratch Backs is another nice welcoming treat for players. You’ll have up to 30 days to claim an amazing 500 Scratchback credits on the first 5 visits. Receive a Cash Back percentage not only on your losses but a percentage on your wins. Now that is bonus not often seen. Clear Play is a great feature that allows players to manage their bonuses and promotions and enjoy a full range of choices. Clear access to wagering requirements needed before requesting a cashout utilizing tools that make it easy to keep track. Players real cash balances can be withdrawn at anytime while take advantage of bonuses at the same time. Club Tingo is a program that rewards players with loyalty points every time they place a wager. The points can be used towards free bonus credits to play over two hundred games. There is a very contemporary approach to online bingo that is captivating. Cash Backs on wins are a rare find. We rate Wintingo with 4.5 Pink Hearts. I've been reading a lot about Wintingo lately so wondered what all the excitement was about. When you enter their site, one of the first things you notice is the counter for total winnings. And it's going higher and higher as you view the page. Wintingo promises a 95% real payout. They offer fixed odds games with every 3rd card being a winner. I am not sure if this is for scratchies only or if the 95% is for the entire site. Either way, this sounds pretty nice. Apparently they have slots that are mixed with scratchies with their game, The Witch Race. Adjust your bets, decide how many witches to play, and start racing! You are betting on the witches to reach the finish line (or not), so get your game face on and try to win the max $500,000 prize. MEGA Bingo is, well, scratch card bingo! It is a 90-Ball Bingo game and lets you play up to 12 tickets at a time. The jackpot at MEGA Bingo is $100,000.00. This site makes me just get a win-tingly feeling. I hope you enjoy playing here at Wintingo. I really enjoy the gaming at this site! Their variety of gaming is huge! Their wide selection includes bingo, video slots, scratch cards, instant win and table games. I was most impressed with their bingo here. They even have themed games such as electro, mega, sassy and super bonus bingo games. It makes for a much more unique and exciting gaming space. It took me a little while to really warm up to this site. Prior to registering, I scoped out the site just to see what they had to offer before I went ahead and committed to playing. I think they could definitely stand to do a bit of reorganizing. It’s a little hard to navigate and some information isn’t as clear and straightforward as it could be. However, I really grew to love playing here once I gave it a chance. They also have some really nice jackpots and the convenience of 24/7 live support. I've seen my fair share of sites claiming the 95% payout, and while there is no way of checking that out, a few of them actually managed to live up to the expectation. Wintingo is among them, and every time I played on this site, I won something, and I have a very good history there. I can't say that I like how the site looks like, but you can quickly see the games offered, along with the list of current winners. The registration process is a fairly simple one, and can be completed in a few minutes. I was very interested to see the welcome bonus package, and this is one of the very few sites with this good cashback program. Your first deposit will get you up to 65% cashback, and next three deposits up to 30%. I wish they had a no deposit bonus as well, a nice way to test how the games work.